A long-awaited White House report on the state of the U.S. industrial base finds that "all facets of the manufacturing and defense industrial base are currently under threat," and warns that entire industries vital to national security are facing "domestic extinction." The report, which was directed by an executive order that President Donald Trump signed on July 21, 2017, took a year to complete, involving a dozen federal agencies and 300 workers. Its findings were distilled down to 50 pages plus appendices summarizing the stresses eroding U.S. industrial strength. Many of the recommendations derived from the analysis are contained in a classified (secret) annex -- some of which are already being implemented. 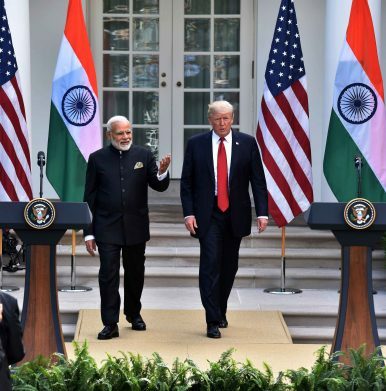 Ankit Panda offers a concise summary of what the COMCASA agreement, which ensures cooperation on communications technology and policy, means for the future of U.S.-India relations. It clears up one of the last big roadblocks for U.S.-Indian interoperability, making arms transfers easier and paving the way for improved cooperation on innovation and production. The U.S. Department of Defense has also suggested that India (along with Indonesia and Vietnam) will not be sanctioned under CAATSA for purchasing Russian military equipment. The closer relationship between the United States and India has big implications for the future of India’s defense industrial base (DIB). India is adopting a technology-management model that resembles that of the United States in some ways, even though the structure of the Indian DIB remains radically different. Signs that President Donald Trump’s “America First” policy could harm U.S. businesses and curb the United States’ clout around the world surfaced this week in an unexpected place—a small town outside London, during the world’s largest civil and military air event. The biennial gathering at the Farnborough International Airshow in the United Kingdom brings together military officials, diplomats, and arms dealers from around the world for plane-watching and deal-making. In other years, the United States has sent the Defense Department’s top weapons buyers, and top-end American products, such as the F-35 stealth fighter jet, have taken center stage. This week, the Department of Defense is scheduled to send the White House a long-awaited comprehensive interagency assessment on the health of the defense industrial base, identifying areas where efforts must be taken to strengthen domestic manufacturing capabilities and highlighting materials on which the U.S. is dependent upon China. Responding to an Executive Order issued by President Trump last summer, the report promises to shake up the way DoD has managed supply chain vulnerabilities for the past decade. Certain defense sectors will undergo stress tests as part of a study about the state of the industry that was recently ordered by the White House, a Pentagon official said Sept. 6. “We’re going to be pressure testing the defense industrial base,” said John McGinn, acting deputy assistant secretary of defense of the office of manufacturing and industrial base policy in the office of the undersecretary of defense for acquisitions, technology and logistics. “We’re going to be … looking at different [operational] scenarios” to see how they would react to different contingencies, he added. The assessment is required under an executive order signed by President Donald Trump on July 21. The Pentagon, working with other agencies including the Departments of Commerce, Labor, Energy and Homeland Security, has 270 days to finalize a report. A loss of more than 60,000 American factories, key companies and millions of manufacturing jobs since 2000 “threatens to undermine the capacity and capabilities of United States manufacturers to meet national defense requirements,” the order said. Less than a year ago, DJI knocked the California-based 3D Robotics out of the consumer market. Now, the US firm has turned to software — and a partnership with its vanquisher. It’s like the drone equivalent of IBM partnering with Apple. Today (Aug. 1), 3D Robotics announced a partnership with DJI, where the California-based company will integrate its site-scanning software with the Chinese firm’s drones. Once upon a time, all the way back in 2015, 3D Robotics (3DR) was one of the most promising new consumer-drone companies, touted as one of the main companies, alongside DJI, Parrot, and Yuneec, that would bring small personal drones into the mainstream. Chris Anderson, the company’s co-founder and Wired’s former editor in chief, quit his post at the magazine—after publishing one last cover story about the future of drones—to concentrate on 3DR in 2012. But 3DR struggled to produce its flagship drone, the Solo, at scale, then suffered weak holiday sales; in the process, 3DR burned through the majority of the nearly $100 million it had received in venture capital, laid off 150 people, and decided that it was going to leave the hardware market to concentrate entirely on software for commercial drones. In just one year, the nation’s largest defense contractor has injected close to $20 million into tech startups. And more investments are coming, says Chris Moran, executive director and general manager of Lockheed Martin Ventures. Moran spent three decades in Silicon Valley before joining Lockheed Martin in June 2016. The company’s $100 million venture capital shop had been dormant for a few years and Moran was hired to revive it. His most recent pickup is Terran Orbital, a manufacturer of tiny spacecraft known as nanosatellites. Space companies have been popular targets of investors. Defense contractors are especially attracted because of the crossover appeal for military and commercial options. Lockheed became an early financer of New Zealand's Rocket Lab, which is building a carbon-composite rocket to launch small satellites into orbit for less than $5 million. In a major policy reform intended to promote Make in India in defence manufacturing, the Ministry of Defence (MoD) announced on May 31, 2017 the much-anticipated Strategic Partnership model for the Indian private sector.1 The model, whose concept was first suggested by the Dhirendra Singh Committee in its July 2015 report, populates Chapter VII of the Defence Procurement Procedure 2016 (DPP 2016). It visualises designating a few private companies as Strategic Partners (SPs) that would not only assume the role of system integrators but also lay a strong defence industrial foundation by making long-term investment on production and R&D infrastructure, creating a wider vendor base, nurturing a pool of skilled workforce, and making a commitment to indigenisation and technology absorption. The ultimate aim of the model is to enhance India’s self-reliance index in defence procurement which continues to remain at an abysmally low level despite a huge defence industrial complex much of which is managed by state-owned Defence Public Sector Undertakings (DPSUs) and the Ordnance Factory Board (OFB). The strategic partnership model seeks to identify a few Indian private companies as Strategic Partners who would initially tie up with a few shortlisted foreign Original Equipment Manufacturers (OEMs) to manufacture big-ticket military platforms. In the initial phase, the selection of SPs would be confined to four segments: Fighter Aircraft, Helicopters, Submarines, and Armoured Fighting Vehicles (AFV)/Main Battle Tanks (MBT). In each segment, “only one SP would generally be selected”, says the new DPP chapter. Private Defense Firms Are Here To Stay – What Does That Mean For National Security? June 1 (UPI) — Share prices of many military and intelligence contractors have risen sharply since President Donald Trump‘s election. Investors are betting that an increase in defense spending will provide a windfall for these firms. For instance, General Dynamics, a large contractor that develops combat vehicles and weapons systems for the U.S. military, saw its stock price jump by more than 30 percent in the months after the election. Likewise, Kratos Defense and Security Services, a smaller firm that builds drones for the U.S. Air Force, saw its shares soar more than 75 percent between November 2016 and May 2017. This trend may be short-lived. Congress still must decide whether Trump’s proposed 10 percent increase in defense spending is practical given current budget constraints. The notification issued by the Ministry of Home Affairs (MHA) on May 19, 20171 delegating the power to issue licences for the manufacture and sale etc. of arms and ammunition to the Secretary, Department of Industrial Policy and Promotion (DIPP) raises more questions than it provides answers. The powers and functions delegated through this notification are the ones that are exercisable by the MHA under the following provisions of the MHA-administered Arms Act, 1959: sub-section (1) of section 5 (dealing with licences for manufacture, sale, etc. of arms and ammunition), clauses (b) and (c); section 7 (dealing with prohibition of acquisition or possession, or of manufacture or sale, of prohibited arms or prohibited ammunition); and, Chapter III (containing provisions relating to licenses). The notification also says that the delegated powers are to be exercised in respect of the category of arms and ammunition and defence items specified in the schedule that forms a part of the notification. This would have been alright but for the fact that the items mentioned in this schedule are actually defence items that were notified by the DIPP vide Press Note 3 of 2014 series 2 with a view to bringing about absolute clarity about the defence items that require industrial licence under the provisions of the DIPP-administered Industrial (Development and Regulation) Act, 1951. War kills. And war sells. These maps show the world's four biggest arms exporters and their major clients. While they reveal a lot about who mongers weapons to whom, the sequencing on this graph is a bit misleading. With former defence minister Manohar Parrikar’s return to the position of chief minister of Goa, the global defence industry is asking one big question: What will happen to the defence reforms announced by him? India faces a significant shortage of critical defence equipment, including fighter aircraft, submarines and helicopters, which India’s defence public sector undertakings (DPSUs) have been unable to address. This reality was publicly stressed yet again in March by a parliamentary standing committee on defence. If the Indian military is to manage this challenge, critical policy issues such as defence procurement reform need to be finalized. To address this issue, Prime Minister Narendra Modi and Parrikar introduced the concept of nominating “strategic partners” in defence production. The idea appears to be that the government should designate vetted private Indian companies to specific areas of national security importance, such as manufacture of fighter aircraft, tanks or submarines, to develop technologies and systems. The only sub-theme that vies for pride of place alongside the debate on the alleged shenanigans of an inept civilian bureaucracy is the gross inadequacy of defence outlays. Governments have come and gone since 1947, but the sluggish trajectory of annual defence budgets continues, interrupted only by pay commissions and wars. It does not require any great power of prophesy to rule out a steep hike in the defence budget in the coming years. The history of the defence budget over the past seven decades should be enough to drive home this truth. More specifically, the growth in annual defence allocations since 2014 only indicates that it is naive to expect that the gap between the demand projected by the Ministry of Defence (MoD) and the actual allocations made for defence in the union budget will soon be a thing of the past. Defence analysts never tire of mentioning the year 2004 when the then outgoing government made a provision for a defence modernisation fund in the interim budget, seen till date as a bold step to address the problems besetting the modernisation of the armed forces. But it is the same political dispensation which, despite being in power now for almost three years, not only has not revived the defence modernisation fund but has also failed to cut the mustard when it comes to raising the defence expenditure. As Donald Trump begins his Presidency, leaders in India face the question of whether to sign two long-delayed agreements to facilitate closer security cooperation with Washington. In New Delhi last week U.S. Pacific Commander Admiral Harry Harris offered a useful illustration of why the deals matter. Without them, he noted, India and the U.S. won’t be able to share vital information about China’s intensifying submarine presence in the Indian Ocean.